Royal Challengers Bangalore 5-156 (Chris Gayle 92*, Virat Kohli 24, Jasprit Bumrah 3-32) beat Mumbai Indians 5-154 (Dinesh Karthik 60, Ricky Ponting 28, Vinay Kumar 3-27) by two runs. Royal Challengers Bangalore crushed Mumbai Indians in a thriller by the assistance of a blistering knock from Chris Gayle and a superb final over off Vinay Kumar. Royal Challengers powered 156 runs for the loss of five wickets in their allocated quota of 20 overs and Mumbai fell short of just two runs with five wickets still in hand. 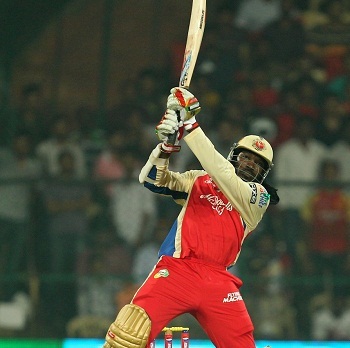 Chris Gayle (Royal Challengers Bangalore) was declared ‘Player of the match’ for his crunchy unbeaten innings of 92 off 58 mere balls. The 2nd match of the Indian Premier League was played on Thursday, April 4, 2013, at M Chinnaswamy Stadium, Bangalore. Earlier, Ricky Ponting, the captain of Mumbai Indians, won the toss, preferred to chase and sent in the rival team for batting. Royal Challengers lost Tillakaratne Dilshan on the second ball when he was clean bowled by Mitchell Johnson for a duck. Chris Gayle scored three runs from the first seven balls as his skipper, Virat Kohli joined with him and hit 1 six and 3 fours in the next two overs but was gone for 24 off just 14 deliveries with 1 six and 4 fours. Gayle remained silent at his end and scored just four runs from 13 balls but came on his own and added 1 six and 2 fours in the following overs. He became the lone fighter and rushed to his fifty in the 14th over with a couple of fours. The wickets kept on sliding from the other end as Gayle hit another 2 sixes and 4 fours until the end of the 20th over. Royal Challengers Bangalore smashed 156 runs with five wickets remaining whereas Chris Gayle secured his end by hammering 92 from 58 balls comprising 5 gigantic sixes and 11 sweetly timed fours. Jasprit Bumrah was the highest wicket taker with three whereas Mitchell Johnson and Harbhajan Singh claimed one wicket each. Mumbai Indians opened their innings probably with the eldest duo in the IPL as the 38-year-old Ricky Ponting walked in with the little master, Sachin Tendulkar who is nearly 40 years old. The pair scored 27 runs in the first five overs as the latter hit two back to back fours in the next one and posted the first fifty of the innings on the first ball of the 8th over. Tendulkar was run out for 23 and was replaced by Dinesh Karthik as Ricky Ponting became the next victim for 28 at the total of 62 runs. Rohit Sharma got together with Karthik and took the score to 88 in 13.4 overs when the first was clean bowled by Vinay Kumar for 11 runs. Mumbai Indians required 51 runs from the last 24 balls as Karthik took over and dispatched 3 consecutive sixes followed by a four in the 17th over off Daniel Christian and also completed his fifty. The match looked being in the grip of the Mumbai Indians since they needed just 10 runs from the last 6 balls. Virat Kohli handed over the ball to Vinay Kumar who clinched the important wicket of Dinesh Karthik for 60 off just 37 with 4 lofty sixes and 3 fours. The stumps of Ambati Rayudu were dislodged on the very next delivery for 18 and their innings was restricted to 154 after losing five wickets at the end of the 20th over. Vinay Kumar grabbed three wickets and Murali Kartik was the only other successful bowler with one wicket. 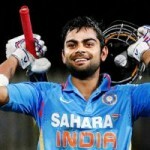 Royal Challengers Bangalore won the cliff –hanger with a margin of just two runs and gathered two points as well.